More than 200 media outlets highlight study about NBA Playoffs. Now Yahoo Finance issued a study about social media during the NBA playoffs conducted by a partnership between MrPredictions and University of New Mexico. The news resulted in a cascade of publications in more than two hundred media outlets in the United States. This means a potential audience of 80 million people considering the number of visitors/day. If you want to see all the media impact report click here. Read the article published in Yahoo Finance below. The digital engagement map points the Los Angeles Lakers in the first place with 32,704.752 million followers. Chicago Bulls comes in second place with 25,421.253. Both franchises are out of the playoffs. 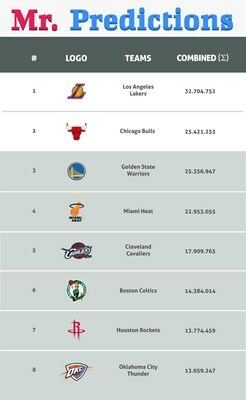 Among those classified for the post-season, the top-ranked social media engagement team is the Golden State Warriors with 25,356.947 million subscriptions. The work is the result of cooperation between the science house MrPredictions and UNM. The main goal of the cooperation is to implement the P2ELab (Peace & Predictions Engineering Laboratory) in Albuquerque. The scientific coordination of P2ELab is performed by the researcher Hugo Cesar Hoeschl (Post-Doc), associate professor at UNM (LAT), under the supervision of Ramiro Jordan (PhD), Professor and Associate Dean of the ECE Department of UNM. In the context of predictions, the purpose is the technical-scientific analysis of large masses of data so that it is possible to anticipate scenarios in organizational environments. In this sense, the first step is the collection and organization of comparative information, hence the importance of achieving this sort of ranking. The MrPredictions science house works in partnership with Mapa Institute and the companies Nexxera and Núcleo Mundial. The team of researchers is coordinated by Tânia Bueno (Doc), also an associate professor (LAT) at UNM. It is expected that P2ELab will become the most important international hub for providing predictions for the international market, positioning UNM as one of the main world references in the subject. Especially considering the background of MrPredictions' team of experts, who pre-set the outcome of the US presidential elections in 2016. Among the next steps of P2ELab is the development of other rankings (US universities, NYSE, NASDAQ, NFL, FIFA and NASCAR). In a later stage will begin the generation of inferences for decision making from scientific data analysis (data science). Still under the basketball it highlights the fact that some players alone have more followers than their teams. This denotes that the bond of the fans is often greater with the athlete than the franchise itself.